It was the season of preserving for last month's Love Cake theme of Jamming. You can read the round up here. For this month we're looking towards the colder, darker days ahead of us. It's time to think about added a touch of spice to our baking. Go wild and have a look down your spice rack to see what you can incorporate in your cakes. 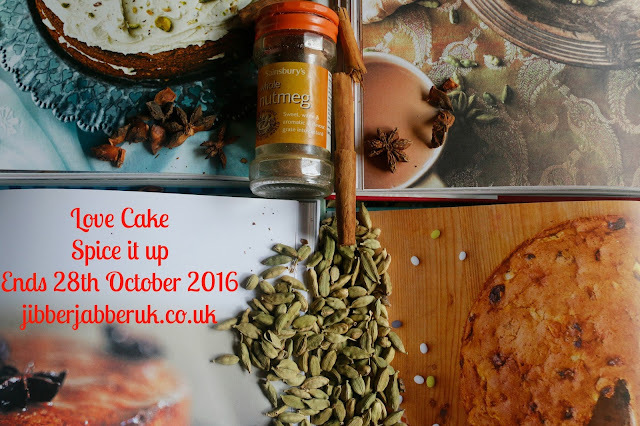 For chilly days warm yourself up with a chilli chocolate cake or get organised and start off your Christmas cake with some mixed spice. Perhaps you fancy a trip around the world with some Jamaican ginger or a visit to the Orient with star anise. Therefore the theme for this month is SPICE IT UP. 1. Please make sure your entry conforms to this month's theme of SPICE IT UP. 3. Enter the URL (web address) of your post into the Linky at the bottom of this post. Once the link closes on Friday 28th October at 23:55 no more entries will be accepted.